Compared to most I am fairly new to yoga. It is something that I have dipped in and out of over the years, but it wasn’t until recovering from a cycling accident in 2015 that I really found that a regular practice helped me to regain my strength, both mentally and physically. My first experience of yoga was mainly through home practice, helped by online classes, books and the odd workshop. I fell in love with the practice and in 2017 I went to Greece on a magical yoga holiday, where after many conversations with the teachers, was inspired to look at teacher training myself. The choice of courses was quite overwhelming, but as a CAMYOGA member it seemed an obvious choice to enrol with them and, being impatient, I liked the fact the intensive course could be completed within six months and was fairly local to my home in Cambridgeshire. I’m not your average new teacher. For a start, my teacher training course was a 50th birthday present to myself. I am also no gymnast and know too well the wear and tear that years of cycling and running can cause on the body as I am tight, lopsided and click a lot, so when looking for a training course I was very conscious of all of this and extremely nervous about what I was entering into! I shouldn’t have been, the other students were all lovely, I wasn’t the oldest (not that it would have mattered if I was!) and on the first day, everyone was apprehensive about what was to come. This year has been truly amazing. I thoroughly enjoyed the training and am still in touch with all the other students. It was a tough, emotional and inspirational 6 months that I will never forget and it was well worth it. Since qualifying, I have reduced my hours as a management consultant to part-time and have started my own yoga and wellbeing business. 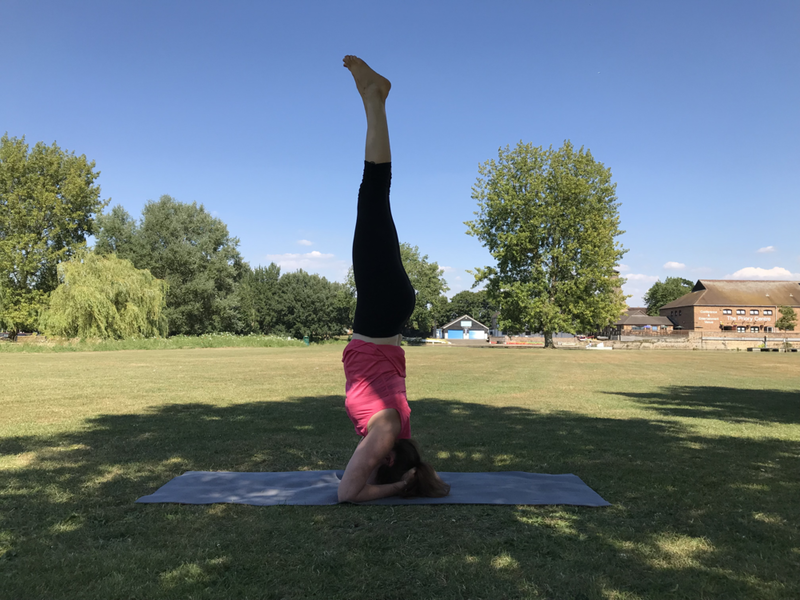 Along with offering private nutritional advice I now also teach 5 yoga classes a week in Buckden and Stonely, Kimbolton in Cambridgeshire to a wide range of students and absolutely love what I do. And the best bit? All the doubts that I had about being too old, not ‘gymnastic’ enough and quite new to yoga have proved to be positives as they mean that I bring honesty, understanding and real-life experience to my teaching.